Pregnancy, Birth & Your Body is a nurturing class for mums to be. There are Pilates exercises to encourage baby into optimal position for birth and condition your pelvic floor as well as stretches and relaxation to relieve pregnancy aches and strains. I’m an expert in the field of pre/post natal exercise both in the classroom and in print/online, I’m an active member of my local NCT branch and liaise with midwives and prenatal professionals internationally to ensure my classes are the best you can get. Saturday mornings, 9.30am at the United Reformed Church, Epping. Thinking about Pilates during pregnancy but not sure what it’s all about or if it’s for you? Fit School Pilates for Pregnancy uses modified Pilates exercises, stretches and education to provide a comprehensive course of exercise, tailored to pregnant women. The course aims to offer advice on all aspects of exercise during pregnancy as well as helping women’s bodies to cope with the demands a pregnancy places on it and prepare for labour, birth and post natal recovery. 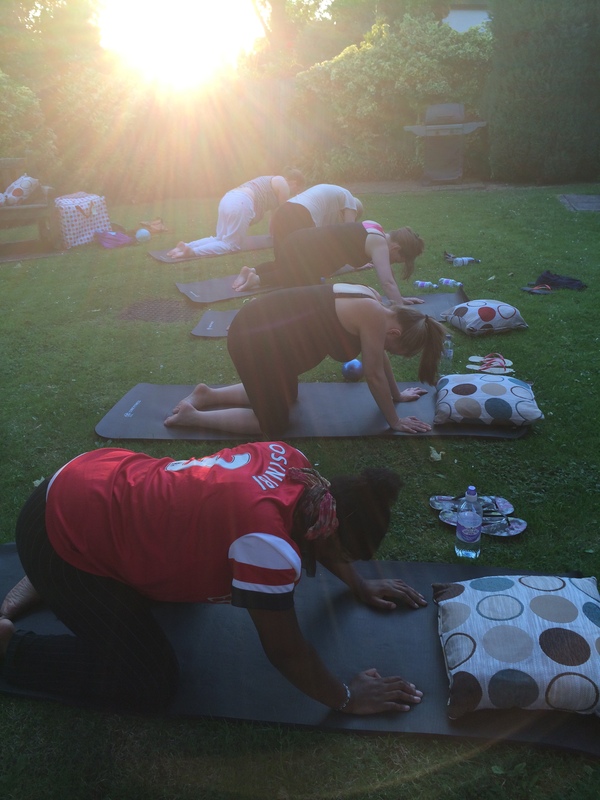 As a women’s health exercise specialist, I’ve been working with pregnant and post natal women for over nine years all over London and Essex, both in classes and privately. As well as teaching classes, I write and present regularly on the subject of women’s health for national magazines and websites and for the NCT. From experience, research and continuing education I’ve created what I feel is the optimum gentle exercise programme for mums-to-be. The focus is on helping your body cope with the demands of a pregnancy and preparing your body for labour, birth and the immediate post natal period. There are six core components which run through all classes and courses. Pelvic floor health, posture, strength and conditioning, pelvis mobility, stretching and mobility, breathing and relaxation and optimal baby positioning for birth, as well as perhaps the most important element: INTERACTION! I love you to ask questions, quiz me and share your experiences, that way the class is all about you and your needs. THE PELVIC FLOOR. During pregnancy, postural changes, baby weight and hormones can all affect your pelvic floor muscles. As well as holding your pelvic organs in place (and controlling pees and poos) a strong pelvic floor can help labour and birth. A toned pelvic floor can also stretch more readily, minimizing the risk of tears or trauma. During classes we learn how to find, train, use and relax the your pelvic floor muscles. POSTURE. Low back and shoulders can all be affected by pregnancy and associated weight gain. We use simple exercises and stretches to help your body relax and feel more comfortable. Strengthening core and pelvic floor muscles can also help to support a growing baby and make every day tasks more comfortable. STRENGTH AND CONDITIONING. During classes we aim to strengthen the core abdominal and back muscles which can help support a growing bump. We describe these muscles like a blanket, enveloping baby. The very specific way that Pilates exercises train abdominals can help a woman’s body to return to pre pregnancy state quickly. We also work to strengthen legs, bottoms and shoulders which all help to support a pregnant bump until baby is ready to say hello. PELVIS MOBILITY. We incorporate gentle pelvis mobility into every class. This can help ease aches and pains in the lower back and can also assist during delivery. BREATHING AND RELAXATION. Breathing and relaxation is fundamental to Pilates. Deep breathing can help with relaxation during contractions and can also help when using gas and air. OPTIMAL BABY POSITIONING. Some exercises in Pilates can help to optimise baby positioning for birth, head down, spine facing out, body slightly left of centre. This might be encouraging baby to shift from a breach position or gently encouraging baby’s back to turn to the front of mum’s tummy.